Do organizations say what they intend to do? Not necessarily. This came out clearly from the three long lectures by RSS Sarsanghchalak Mohan Bhagwat. The event was supposed to be a dialogue, but the maximum of dialogue one could see was his answering few questions at the end of lectures. This normal practice of answering the questions was underlined strongly, as probably this must have been novel thing for this organization. What did Bhagwat say which was new? He did say that Hindutva includes Muslims, RSS respects Constitution, RSS is not opposed to reservations, RSS is not dictatorial-there is a place for opinions of others apart from that of Shri Bhagwat also, RSS respects the diversity of this Hindu nation etc. It became clear the gentleman was answering to the criticism of his organization by its critics, and there are plenty of them. What appeared novel was the change in the language of RSS from its major ideologue Guru Golwalkar to Mr. Bhagwat, the current chief? While Golwalkar bluntly appreciated the Nazi methods of exterminating the minorities, Bhagwat sounded to be accepting the existence of religious minorities. While Guru was announcing the Muslims, Christians and Communists are internal threat to Hindu nation, Bhagwat went on to say that they don’t fully agree with Guruji so his book, ‘Bunch of Thoughts’, has been republished by omitting such sentences which are threatening to minorities and asserting the Hindu nationalism in a blunt way. So has RSS changed? In case of most of the organizations, they should be judged by their actions, or by the outcome of activities and the programs of the organizations which come into being due to RSS ideology. That’s what will tell us the true character, real agenda of RSS and help us assess why a pleasant face is being presented now? 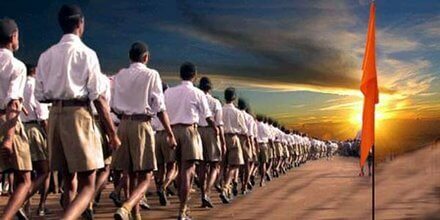 The core activity of RSS is structured around Shakhas (Branches). In these shakhas young boys are given the physical training, one component of training is wielding lathis (batons). This is what is the most visible part of its activities. Running parallel to this is the ideological training, the bauddhiks (intellectual) sessions. This is where the real agenda of RSS gets itself manifested. In these shakha bauddhiks, which are backed up by long training camps leading to three year training program, the outcome of which are the Swamyamsevak/Pracharak, who is ready to take on the mantle of RSS programs in an independent way. These bauddhiks indoctrinate the young boys in to believing that, India has been a Hindu nation from times immemorial. Roughly RSS training module, as gleaned from various sources, follows these lines. ‘We’ were having a great society, all castes were equal, women had honorable place in the society. The society was attacked by foreigners, the Muslims, leading to inequality of castes and degeneration of status of women. The Muslim kings destroyed our temples, and imposed Islam by force. The Muslim kings were very cruel, Mohammad Gazani (destroying Somnath) Mohammad Ghori (Betraying Prithivraj Chowhan). Hindu kings like Maharana Pratap and Shivaji saved the Hindu society. During freedom movement, while Savarkar put forward Hindu nationalism, the likes of Gandhi-Nehru and their followers regarded people of foreign religions also belonging to this land. Gandhi appeased the Muslims due to which Muslims got emboldened and demanded Pakistan; it’s due to faulty policies of Nehru that Kashmir, the integral part of India, has become a problem and so on and so forth. The prachraks/swaymsevaks after this training go in to different segments of society, or into directly floated organizations, Bhartiya Jansangh, ABVP, BJP, VHP, Vanvasi kalian Ashram, Seva Bharati to name the few. Technically these are all independent organizations, but they are run and controlled by the trained prachraks of RSS. So RSS does not have to act as remote control as its ideology runs into the DNA of these organizations. The RSS module of indoctrination has created hatred in the society, hatred against Muslims and partly against Christians and those upholding secular values-liberals. One manifestation of this Hatred was the murder of Gandhi by Godse, who was the trained Pracharak of RSS. Sardar Patel must have been the first one to articulate this and see beyond the murder of Gandhi. He could see that the core reason of Gandhi’s murder was spread of Hatred in society by RSS. While RSS has volunteers dressed in RSS uniform doing relief work, those taking up arms to indulge in violence are the one, who are guided by this hate against religious minorities. The violence prevalent in the society has been the outcome of issues, which are related to emotions brought into the service of Hindu nationalism of RSS. The communal violence went up in the wake of Ram Temple issue. If the country belongs to all, all religions are respected, why the crime of demolishing a five hundred year old mosque? Why marshalling of communal view of history to polarize the society? On similar lines why Holy cow is the political issue, while swami Vivekanand did say beef was eaten during Vedic times and Gandhi posited that state should not take up banning of cow slaughter or banning of beef? One must say that RSS, as it has got renewed confidence during last four years is now trying to spread its net by mouthing liberal language. This velvet glow is the contribution of Mr. Bhagwat to the deepening divide created in the society due to the all round work of the progeny of RSS, which while sounding independent is totally loyal to the trainings it got while attending shakha baudhhiks. So we know that when the Jansangh component of Janata Party was asked to severe its links with RSS, they preferred to break the party and reemerge as BJP. So the late Prime Minister Vajpayee in Staten Island, while talking in front of NRI Indians reaffirmed his primary loyalty to RSS. Its respect of Indian Constitution is a sham as; for Indian Constitution; we are a secular democratic India, in contrast to Hindu nation, the soul of RSS agenda.